Assemble the cake just before serving to prevent banana slices from browning. To make Cake: Preheat oven to 350 degrees F. Grease and flour a pair of 9-inch round cake pans. Sift together flour, cinnamon, baking soda, baking powder, nutmeg, and salt. Whisk together mashed bananas, yogurt, honey, and vanilla in separate bowl. Cream butter and brown sugar with electric mixer until fluffy. Add eggs one at a time until combined. Stir in flour mixture, and then banana mixture, until combined. Divide batter between prepared cake pans. Bake 20 to 25 minutes, or until toothpick inserted in center of Cake comes out clean. Cool on wire rack 10 minutes, remove Cake from pans, and cool completely. To make Frosting: Beat cream cheese, butter, and vanilla with electric mixer until smooth. Beat in confectioners' sugar, then chocolate and cocoa powder. To assemble, place one Cake layer on serving plate. Spread with 1 cup Frosting. Top with half of sliced bananas. 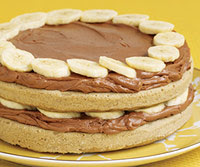 Add second Cake layer, and top with remaining Frosting and sliced bananas. Cut into 16 slices. Serve at room temperature. Calories 355, Total Fat 14 g, Saturated Fat 8 g, Cholesterol 57 mg, Sodium 207 mg, Carbohydrate 54 g, Fiber 2 g, Protein 6 g, Sugars 32 g.
This entry was posted on 5:47 PM and is filed under Desserts . You can follow any responses to this entry through the RSS 2.0 feed. You can leave a response, or trackback from your own site.